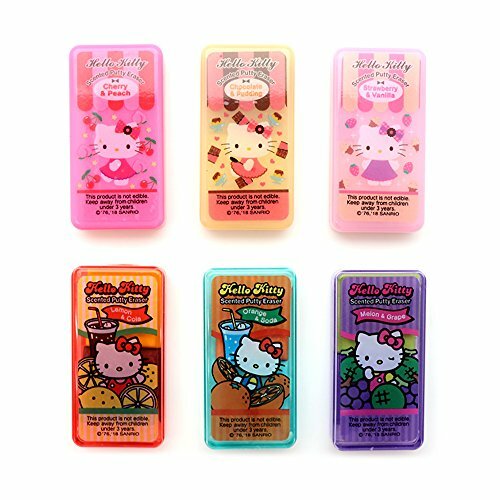 NEW Sanrio Hello Kitty Scented Putty Erasers : 6 Erasers (Total of 12 Scents) 12 Great Scented Fruit Food Scents In 6 Collector's Box (2 Scents in each box) Scents : 1. Cherry & Peach 2. Chocolate & Pudding 3. Strawberry & Vanilla 4. Lemon & Cola 5. Orange & Soda 6. Melon & Grape Size :H 2-1/2" x W 1-1/4" x L 1/2" This product is not edible. Keep away from children under 3 years. Size :H 2-1/2" x W 1-1/4" x L 1/2"
This product is not edible. Keep away from children under 3 years. If you have any questions about this product by Putty Erasers, contact us by completing and submitting the form below. If you are looking for a specif part number, please include it with your message.